Play as the painter's daughter, confront your past. For most people, confronting your family's dark and shameful past is a matter of opening the toilet door before the smell has fully dissipated, so spare a thought for the daughter of the guy from Layers of Fear. The painter at the heart of that first-person horror game turned his home into a sort of arty hellhole, and now his daughter has returned to see what state he's left the family house in. 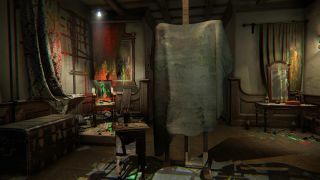 A right old state, if the first trailer for Layers of Fear's Inheritance DLC is any indication. Inheritance releases on August 2, and it will set you back $4.99. In it, you'll "lead the daughter through what’s left of the mansion and take part in the madness that her father bestowed upon the whole family. Can she forgive her father, or will she resent all that has happened?" I'm leaning towards the latter, but you never know. James Davenport wasn't overly enamoured with the main event. Let's hope this upcoming expansion can manage to rustle up a few more scares.